Bordeaux is a glorious celebration of French history and architecture. Since being awarded World Heritage Site status in 2007 for its classical and neo-classical architecture blended with urban development, the Bordelais have been busy renovating and restoring it. They've succeeded very well; this year, 2015, Bordeaux won the European Best Destination Award ahead of Lisbon and Athens. Bordeaux is the regional capital of Aquitaine and one of the most important ports in Europe, exporting, among other things, those glorious rich Bordeaux wines and spirits to a grateful world. Today it's a lively, vibrant city with some of the most gracious architecture in France; good museums; top events and more than its fair share of cafes, restaurants, and bars. It makes a great place for a short stay or use it as a base to explore its famous surrounding wine country. Bordeaux started life as a Roman town and then in the 7th century, was claimed for the new Duchy of Aquitaine by Good King Dagobert. Through the marriage of Eleanor of Aquitaine and Henry Plantagenet, Duke of Normandy and Count of Anjou in 1152, Bordeaux became the capital of a huge area of France, rivaling the King of France in size and importance. All might have gone well, but in 1154 Henry succeeded to the throne of England as King Henry II and became a real threat to France. Three centuries of intermittent warfare followed, culminating in the Hundred Years War during which towns and cities changed hands, often more than once and huge numbers of people perished. In 1340 the English King, Edward III, once again claimed the throne of France and sent his son, the Black Prince to Bordeaux to establish his military headquarters. From Bordeaux, he went out to terrorize and conquer much of the surrounding countryside and inhabitants, most successfully for the English and equally disastrously for the French. The war dragged on until the French finally prevailed in 1453; the British were defeated and the so-called Hundred Years’ War was at an end. The 17th century saw a huge revival in Bordeaux's fortunes; while the 18th century saw the city’s beautification as grand boulevards, flanked by equally grand neo-classical houses, replaced the medieval higgledy-piggeldy quarters. An important city, Bordeaux now became the most important trading port in France. Throughout history, Bordeaux has attracted visitors, from the pilgrims passing through on the way to Santiago de Compostela in Spain (see the French pilgrim routes) to today's tourists. As you might expect from the name, the Golden Triangle is a glorious area. Formed by three boulevards, Cours Clemenceau, Cours de L’Intendance and Allées de Tourny, it’s the place where warm-colored 18th-century stone houses shaded by trees fill the grand streets. At the southeast corner, the Grand Theatre stands on the edge of the Place de la Comédie. The magnificent neo-classical building, built between 1773 and 1780 on the site of a Gallo-Roman temple, is equally impressive inside with columns, a dome, and a staircase which was the inspiration for Garnier’s Paris Opera House. It’s worth attending a concert (particularly during the Music Festival in June). Otherwise, take a tour lasting 45 minutes on Wednesday and Saturday afternoons. In the high season (July and August) tours are daily. A short stroll east of the Golden Triangle's Allées de Tourny brings you to this huge graveled empty square surrounded by tall shady trees. It's notable for the statues of the local heroes, the writers Michel de Montaigne (1533-1592) and Charles Montesquieu (1689-1755), and the extraordinary Monument aux Girondins. The over-the-top gushing fountains and statues of triumphal chariots and allegorical figures topped by the figure of Liberty Breaking Her Chains were put up between 1894 and 1902 to honor the Girondins, originally vociferous supporters of the French Revolution, but guillotined in 1792 on the orders of Robespierre in the Byzantine politics of the Revolutionary Assembly. The banks of the Garonne river were, 15 years ago, a wasteland of empty warehouses and abandoned quays. Today this is a fabulous area, brought to life again with open spaces and gardens. The warehouses along the old quays are full of shops, restaurants, bars, and cafes making this one of Bordeaux’s most vibrant quarters. Once the heart of the city, the district is known as Saint-Pierre. Walk onto the Pont-de-Pierre bridge for a great view back at the old quais that sweep along the banks of the river. The Place de la Bourse opens onto the river, with the Palais de la Bourse, the stock exchange of the 18th century, encircling this wonderful square that smacks of the confident trade of the past. The symmetrical stone buildings make the perfect backdrop for the shimmering miroir d’eau, a mirror of water shallow enough to walk through that reflects the glorious palace. It’s floodlit at night when it takes on a magical, almost surreal quality. It's in the Saint Pierre district of Bordeaux. These three buildings make a wonderful cluster of places to visit. The Tour Pey-Berland, built between 1440 and 1446, stands apart from the cathedral. It’s an impressive site and the view from the top of the city and its sights laid before you is worth the climb of 231 steps up a narrow spiral staircase. Beside it stands the Cathédrale St-Andre, a vast building constructed between the 11th and 15th centuries. Sculptures adorn the Porte Royale, the entrance to the right of the north doorway, depicting the Twelve Apostles and the Last Judgement. Try to catch a free organ concert in July and August on Tuesdays at 6 pm. Just behind the cathedral, the former bishop’s palace is a very grand affair. The Palais Rohan was built in the 18th century for the Archbishop, Ferdinand Maximilian de Meriadek, Prince of Rohan, and was the first in the new Neo-classical architectural style in France. Now the City Hall, it's well worth a visit for its great State staircase, rooms covered with 18th-century wood paneling and banqueting hall. It gives you an idea of the importance of both the church and the city of Bordeaux in France. Such a grand city should, and does, have grand Fine Arts and Decorative Arts Museums. Clustered in the streets around the cathedral, the Fine Arts Museum has a pretty impressive collection of European art with the likes of Titian, Rubens, and Brueghel as well as good 20th century works. The museum also puts on good temporary exhibitions. The Decorative Arts Museum shows you life in the past, with porcelain and period furniture, statues, glassware and more laid out in the rooms of an 18th-century mansion. If you want to see what life has been like in this gorgeous western region of France, visit the Museum of Aquitaine which takes you from prehistoric man to today through a wide and fascinating mixture of objects. There is artwork from 20,000 BC; the Treasure from Tayac in the Garonne; a reconstruction of an early 20th-century grocer's shop; Montaigne's tomb, and gold artifacts from the 2nd century BC. The Gallo-Roman section shows the daily life of the provincial capital in glassware, sculpture, mosaics, glassware, and a marble altar. The museum goes through the Middle Ages and onto the golden age of Bordeaux; its ambitious town planning and its 18th-century arts and buildings. It's the sort of very well arranged and laid out museum that invites you to wander through the past taking far longer than you anticipate. All big cities of France have good contemporary art collections, and Bordeaux is no exception. Housed in a former warehouse of 1894, the Contemporary Arts Museum shows some of the collections of the Centre d’Arts Plastiques Contemporains de Bordeaux, plus works on permanent loan from the Pompidou Center in Paris. The warehouse has been imaginatively remodeled producing a huge interior that can house very large works and installations that rarely find the right gallery space. It’s good on art from the 1960s and 1970s: look out for Keith Haring, Sol le Witt and Richard Long and it holds excellent temporary exhibitions. Take a walk along beside the quais of the river Garonne past the splendid Pont de Pierre bridge through an area once populated by the craftsmen of Bordeaux: the rope-makers, cobblers, potters, blacksmiths, and barrel-makers, to the Gothic church of St Michel. The free-standing spire dominates the area, it’s the tallest in the city (and at 114 meters, the second tallest spire in France after Strasbourg), with an outstanding view from the top. If you’re here on a Sunday morning you can rummage in the flea market in the square for bargains. A little further south you’ll come to the Romanesque Benedictine Abbey church of Ste. Croix. Built in the 12th and 13th-centuries, and restored in the 19th century to their ideas of the Romanesque, it’s worth going on a Wednesday at 6 pm to listen to the free organ recital. You shouldn't miss the surrounding countryside where Bordeaux’s world-famous wines are produced. But start in Bordeaux itself, at the Musée du Vin et du Négoce (4 rue Borie). Located in the house of an Irish merchant, Francis Burke, and built in 1720, it covers wine and trades associated with the production. At the end, you get the added bonus of tasting 2 wines. 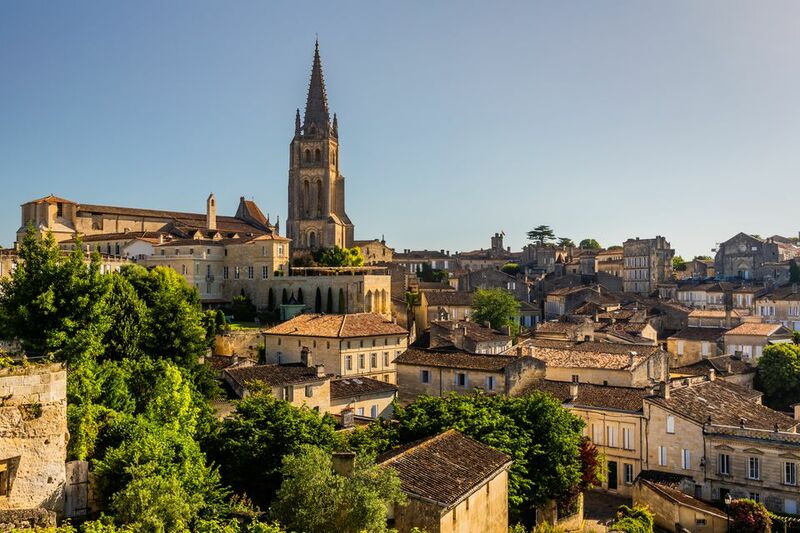 Armed with more knowledge about Bordeaux’s wines, take trips out to the great names of Entre-Deux-Mers, St-Emilion, Margaux, Sauternes, Médoc, and other famous names. You can either do it yourself or take one of the trips organized by the Tourist Office.